Irisation in Altocumulus Lenticularis - Wave clouds imaged by Chris Grohusko of El Paso Texas. Lenticular clouds are mostly found in the lee of hills and mountains. They are good sources of iridescence because the droplets in them have very short lives and have no time to evolve into a range of different sizes.. The clouds stay in the same position but air is rushing through them. When air is forced across a mountain it has to rise and then fall again. Under some atmospheric conditions this induces a whole series of waves downwind of the mountain. An air pocket rising with one of the waves expands as it climbs because the atmospheric pressure falls with height. The adiabatic expansion causes the air to cool and its water vapour condenses into a host of small, fresh droplets. A few instants later the air starts to descend and the downwind edge of the cloud is reached. The air is compressed as it is forced downwards, it heats up and the droplets evaporate - end of cloud. 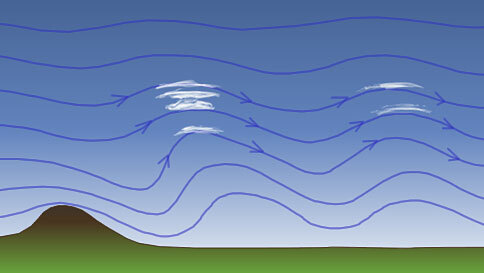 Lenticular clouds are thus very dynamic objects marking the crests of atmospheric waves and the boundaries of droplet condensation and evaporation. Nacreous clouds much higher in the stratosphere are also gravity wave clouds.